Scientists reveal the first detection of a molecule from Enceladus with a ground-based telescope, with implications for the search for life. Saturn's moon Enceladus has piqued scientists' interest since water-rich plumes were discovered gushing from around its south pole. The discovery was made by the Cassini spacecraft, which has since flown through the plumes and sampled organic compounds. The latest results, however, were gained using the IRAM 30-metre radio telescope in the Spanish Sierra Nevada, and reveal a higher-than-expected quantity of the molecule methanol around Enceladus. The work, which included Imperial scientists, will be presented by Dr Emily Drabek-Maunder, of Cardiff University, on Tuesday 4th July at the National Astronomy Meeting. Enceladus's plumes are thought to originate in water escaping from a subsurface ocean through cracks in the moon's icy surface. 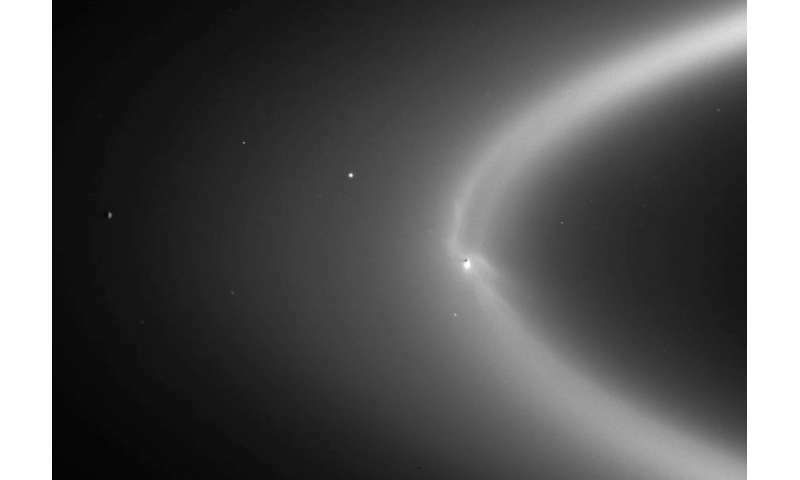 Eventually these plumes feed into Saturn's second-outermost ring, the E-ring. Recent work has found similar amounts of methanol in Earth's oceans and Enceladus's plumes. However, the new discovery suggests that material spewed from Enceladus undertakes a complex chemical journey once vented into space. Dr Drabek-Maunder said: "Recent discoveries that icy moons in our outer Solar System could host oceans of liquid water and ingredients for life have sparked exciting possibilities for their habitability. But in this case, our findings suggest that that methanol is being created by further chemical reactions once the plume is ejected into space, making it unlikely it is an indication for life on Enceladus." Image of Enceladus with the location of a possible confined methanol cloud, the methanol spectrum from the study and images of the methanol molecule. Credit: E. Drabek-Maunder, background image NASA/JPL-Caltech/Space Science Institute. The team suggests the unexpectedly large quantity of methanol may have two possible origins: either a cloud of gas expelled from Enceladus has been trapped by Saturn's magnetic field, or gas has spread further out into Saturn's E-ring. 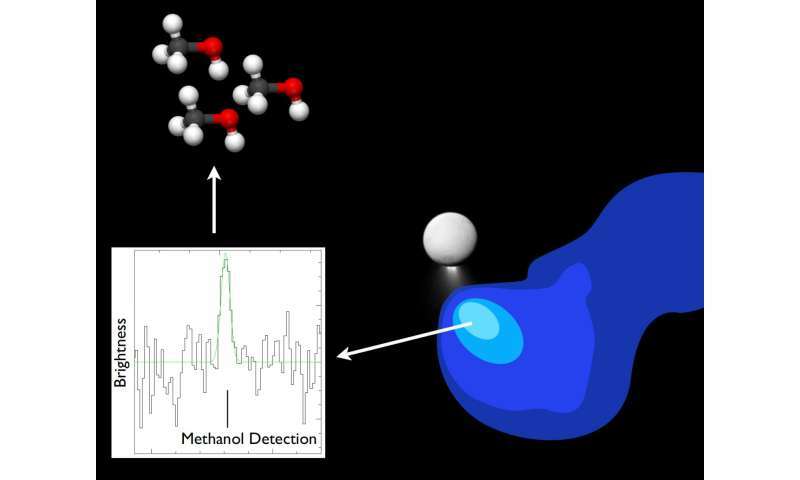 In either case, the methanol has been greatly enhanced compared to detections in the plumes. Team member Dr Dave Clements, from the Department of Physics at Imperial, points out: "Observations aren't always straightforward. To interpret our results, we needed the wealth of information Cassini gave us about Enceladus's environment. This study suggests a degree of caution needs to be taken when reporting on the presence of molecules that could be interpreted as evidence for life." Dr Drabek-Maunder adds: "This finding shows that detections of molecules at Enceladus are possible using ground-based facilities. However, to understand the complex chemistry in these subsurface oceans, we will need further direct observations by future spacecraft flying through Enceladus's plumes."